Annual grass from fibrous roots; stems hollow, up to 80 cm tall. 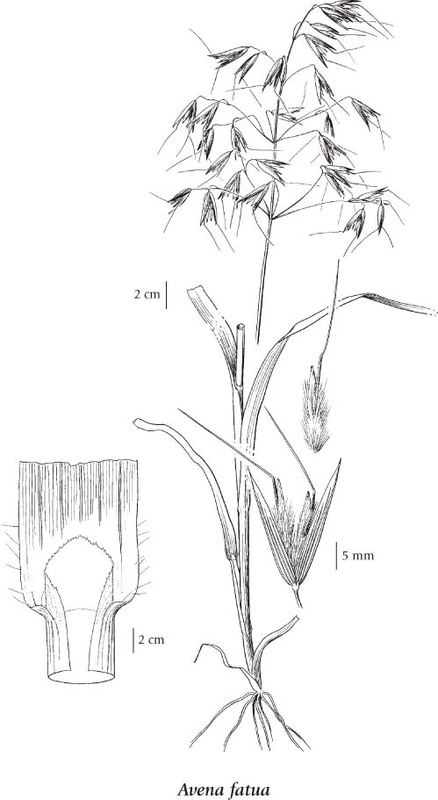 Sheaths open; blades 3-10 (15) mm wide, rough and often more or less soft-hairy; ligules (1) 3-6 mm long, membranous, short-hairy, rounded to pointed, the margins jagged and fringed with small hairs. Inflorescence a large, open panicle, the branches pendulous; spikelets usually with 3 florets, in addition to the rudiments tipping the prolonged rachilla, the lower 2 florets with much twisted, strongly bent awns up to 4 cm long; glumes 20-25 mm long, more or less equal, both usually surpassing the florets; lemmas hardened at the base, the nerves obscure, usually stiff-hairy or nearly smooth, the upper portions greenish and plainly ribbed, the tips thin and membranous and sharply bilobed for about 1 mm, the calluses densely bearded; rachilla readily disarticulating between the florets, strongly bearded or sometimes nearly smooth; anthers 4-5 mm long; lodicules nearly 2 mm long. Dry to mesic fields and waste areas in the lowland, steppe and montane zones; infrequent in S BC; introduced from Eurasia. Avena fatua var. vilis (Wallr.) Hausskn. Avena hybrida Peterm. ex Rchb.